The Ola During Children’s Hospital is close to having the x ray unit up and running. This is very exciting especially since it has been 6 years since the last x ray was taken at Ola During Children’s Hospital. Can you imagine a hospital without x ray services? Presently children need to travel across town to Connaught Hospital for x rays. This is often a three-day process. The child receives an x ray request form on day 1, goes to Connaught very early in the morning on day 2, and goes back to Connaught on day 3to pick up the x ray and report. This is an obvious delay in the diagnostic process. Also, for very sick children, having to travel across town is simply not possible because there is no way to transport them safely, especially if they are in need of oxygen. Clearly, there is a need for a functioning x ray unit. The new x ray unit will complement the ultrasound services in forming the radiology department shared between Ola During Children’s Hospital and Princess Christian Maternity Center. 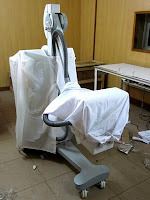 In June the Ministry of Health and Sanitation promised to deliver an x ray unit to the hospitals. Honestly, I was a bit skeptical. However, they kept their word and mid-July an x ray machine was delivered to the radiology department. Step one was complete. The next step: assembling/installing the unit. This took longer than expected, but was a success. The next hurdle was to connect the new processor to the water supply. Unfortunately this proved too difficult, in part due to lack of high quality plumbing but also due to the poor water supply at the hospital. It was decided that for now the old processor would be used until the water situation has improved. Now that the x ray unit is ready for use, the department is faced with the biggest challenge yet, namely, the lack of x ray films and developer and fixer solutions. The government supplied central medical store is in short supply and it is uncertain when or where the next stock will come from. To further compound the problem, Connaught hospital can now only give 10 children access to free x rays per day due to their limited supplies. Of course, one can still pay for an x ray but the majority of the families do not have the Le 30,000 – Le 40,000 ($8-10) needed for one x ray. Yesterday there were three children in the feeding center needing chest x rays who have already made the early 5 am trip to Connaught two days in a row and been turned back because the 10 slots for free x-rays for the day were already used up. This is a bit of a dilemma. So, now I sit here wondering where the supplies will come from and how this department will be sustainable? Will the Ministry step in and be able to help with a constant supply? Will the hospital need to find funds to buy films and solutions from Guinea or possibly even the UK or USA? Will the hospital be able to provide free x ray services for inpatients or will it be on a cost-recovery basis in order to generate income to purchase more supplies? And what is the role of the non-governmental organizations (NGOs) in this? If the NGOs help with the initial supply, how long must they continue supplying and who will sustain this? It is a dilemma and I am afraid I do not have a solution. So, if anyone does have a solution, feel free to comment. And if anyone out there has a never ending supply of x ray films and solutions that they could deliver to the door of the hospital free of charge, you would be more than welcome to do so.